Dr Denise Baden (left) has won the 2018 ESRC Celebrating Impact Prize for Business and Enterprise. A University of Southampton researcher has won a major national award for the impact of her work into sustainable practices within the UK’s hairdressing industry. 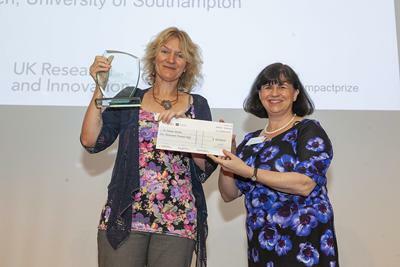 Dr Denise Baden, Associate Professor in the Southampton Business School, has won the £10,000 Economic and Social Research Council (ESRC) Celebrating Impact Prize 2018 for Outstanding Impact in Business and Enterprise. Dr Baden’s Eco Hair and Beauty project is introducing sustainable practices to reduce the carbon footprint and cut costs in the UK’s £6.2bn hairdressing industry. The UK’s 55,000 hairdressers impact significantly on CO2 emissions through high water and energy consumption and, on the environment, through the use of toxic chemicals and harmful waste. Adopting the project’s eco-friendly practices can save the average four-seat salon 286,000 litres of water, 24,150 kWh of energy and £5,300 a year. Dr Baden believes hairdressers are also in a unique position to persuade their clients to adopt the salon’s eco-friendly model in their own homes – with huge potential to cut national carbon emissions. “I am absolutely thrilled to receive this prize!,” Dr Baden enthused. “In the early days I struggled to get this project taken seriously, as some had a rather dismissive attitude towards the sector, but I have been continually surprised and delighted by how keen hairdressers have been to get on board. Based on some of the first ever research into the environmental impacts of hairdressing, Dr Baden has worked since 2012 to transform the habits of the resource-intensive hairdressing sector and cut the UK’s carbon footprint by educating clients in eco-friendly hair care. Successfully launched an online Sustainable Salon Certification and virtual salon training programme for salons and stylists introduced in April 2017. More than 50 salons and 1,000 stylists have gained this certificate which is endorsed by key industry bodies: Hairdressing Council, Hair and Beauty Industry Authority and the Vocational Training Charitable Trust. Ran more than 60 sustainability workshop and training events educating over 2,000 trainers, colleges and industry professionals about greener products and practices, including new water-saving technologies such as low-flow showerheads, leave-in conditioner and dry shampoo. Ninety-seven per cent of hairdressing trainers who attended these sessions said they gave more focus to sustainable practices as a result. Worked with leading hair care bodies, she has changed the industry default recommendation for hairdressers from shampooing twice to just once – with significant water and energy savings. “Since 2014 all qualifications that have been written have now got sustainable practice built into them.” says Lynda Whitehorn, Apprenticeship Manager in accreditation organisation VTCT. “This becomes a self-perpetuating cycle within the industry,” she argues, as apprentices will take these practices with them up into more senior positions. 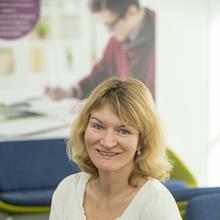 Dr Denise Baden is an Associate Professor within Southampton Business School at the University of Southampton.